MSC Floors is pleased to offer high performance floor coating systems specifically designed for marijuana cultivation facilities and distribution centers. Our green-friendly grow room flooring options and 100% solid epoxy coatings emit no harsh solvents and VOC-Free. The odor-free nature of these advanced floor coating materials make them ideal for use within new grow room construction as well existing operating facility upgrades. Antimicrobial options are available for any of our grow room floors, completely up to code. Introducing a Durable, Light-Reflectant, Shock-Resistant Antimicrobial Grow Room Floor & Wall Solution, the HortiCoat System. Concrete, by its very nature, is a porous material that retains and transmits moisture. Concrete substrates are full of dark, damp crevices and capillaries that make it an ideal breeding ground for a number of microbes, including bacteria, fungi and various molds and spores. For medicinal horticulture and grow processes, this scenario can pose a serious hygienic risk affecting your reputation and bottom line. Many cleaning and sanitization methods can aid in preventing the growth of microbes at the floor or wall surface level. However, normal or aggressive wear from foot and equipment traffic, abrasion loads, hot water wash downs and abrasive chemical cleaning can cause floor or wall surface damage. Wear, chips, spalls and cracks in your floors and walls are a perfect breeding ground for dangerous microbes. And because common cleaning/washdown techniques cannot penetrate deep into these areas, bacteria can live for extended periods and pose potential health threats. So, how does one achieve a redundant antimicrobial system that can address these concerns? A thin-film floor or wall coating modified with an antimicrobial agent or surface treatment is simply not enough. The key to achieving comprehensive antimicrobial protection is to prevent the growth of microorganisms throughout the floor or wall system and deep within the concrete substrate. 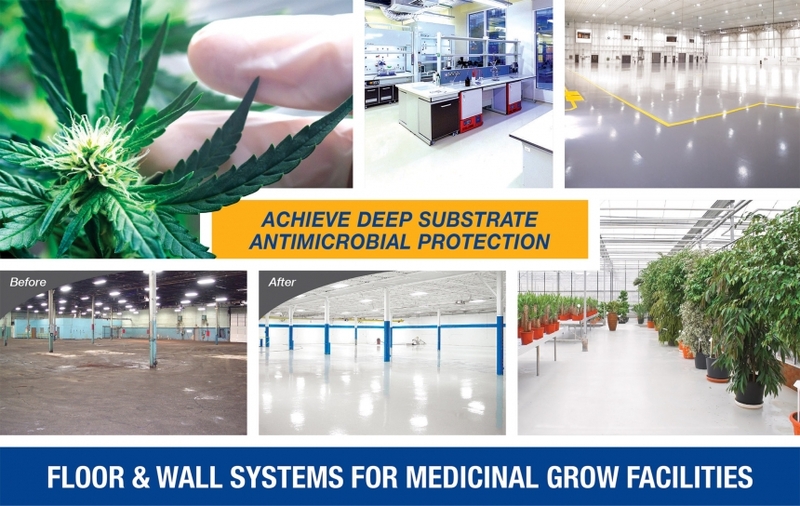 All Protective Industrial Polymers’ HortiCoat Antimicrobial Floor and Wall Systems utilize an antimicrobial concrete pretreatment (Protect AM-PT/Protect AM-PT-BW) that penetrates beneath the grow room floor coating system and deep within the concrete substrate. This pretreatment was developed for use where microbe or fungal growth concerns create the need to permanently hydrostatically seal the slab from within. This product penetrates deep into the concrete slab and forms an aqueous, antimicrobial gel. Subsequent antimicrobial joint fillers, coatings and overlays then complete the system. Need to get a certified antimicrobial grow room flooring floor system for your production grow room facility? Each project begins with a thorough facility walkthrough and project consultation. During this step, a certified HortiCoat Process technician assesses your current floor and wall treatments, inspects the condition of your concrete and learns more about your antimicrobial and sanitation protocols. The technician also identifies your unique requirements and discusses budget and timeline constraints. After the initial project consultation and evaluation, the technician will recommend the proper antimicrobial system to meet your unique project requirements. Additionally, the technician will thoroughly discuss project scheduling, preparation methods and expectations, as well as submit a formal project cost proposal. All HortiCoat Process technicians have years of experience evaluating various floor types, so they can identify an issue before it turns into a problem. You will know exactly what to expect up-front, ensuring you a hassle-free experience. The key to success in a long-lasting antimicrobial floor and wall system lies in proper substrate preparation and installation procedures. Certified HortiCoat technicians, and their crew members, have received extensive training on the installation of antimicrobial systems. The installation team will ensure your floor and wall systems are expertly installed in a timely and professional manner with minimal disruption to your plant operations. Upon completion of the project, the HortiCoat Process technician will work with a manufacturer’s representative to certify the installation. A Certificat of Antimicrobial Substrate Pretreatment will then be issued and your HortiCoat warranty will go into effect. As part of the ongoing certification process, the HortiCoat technician will work with you to facilitate an annual system performance audit to discuss any concerns and verify proper antimicrobial performance of all installed HortiCoat products. MSC Floors is a high-integrity concrete protection and restoration firm experienced in all aspects of concrete floor and wall treatment and protection. As a Certified HortiCoat Process Installation Partner, our MSC Floors’ crew members are Certified HortiCoat Process technicians. Surface Preparation: All coating surfaces will be mechanically profiled to ensure maximum adhesion and long-lasting durability. Installers may also text for moisture and other contaminants and if necessary treat for those to ensure floor coating integrity. It is also at this time in which any holes, cracks or other repair issues are addressed. Our grow room floor installers may use quick repair products to quickly complete repairs to the substrate – large or small. We also use an antimicrobial pretreatment on all our grow room floors to assure your floor system is worry-free throughout its lifespan. MSC Floors has an electrical division which specializes in the installation of LED and HPS grow lights. Learn more about MSC Electrical and their electrical services for grow room and extraction facilities. With grow room and extraction floor installations from MSC Floors, you’ll benefit from high-quality flooring that provides your facilities with what they need to maintain sanitation and more reparability. Contact us at any time to discuss your grow room flooring needs and we’ll work with you to meet your specific requirements. Our combined staff and resources will allow us to create the perfect flooring solution regardless of the type of facility you have.